404 Pages: The 404 not found error message is a form of standard HTTP response code, which indicates the client that the destination which he is looking for, is unable to interact with the server or has no existence. 1000 is the delay time in microseconds. Anyone can change it. Changing the value to Zero (0) would redirect immediately without any delay. Save it and that’s it. 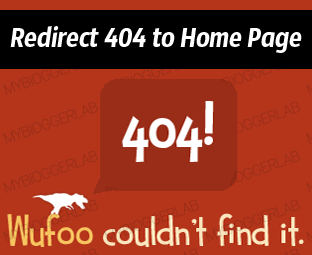 Now whenever a visitor would hit a 404 page, it would automatically redirect him to your homepage. Note: This technique should be used only if lots of your indexed posts are deleted and they are getting high SERP ranking. Great Post! Thanks for the information Faizan! cool idea bro, thank you for sharing this with us !! well, can i add the script after that? Yes, you can add the Code there! No, if you're not getting any errors than there is no need to use this technique! Sorry for the inconvenience, the page you are looking for has no existence. Sorry for off topic. Do you have URL filter in Blogger commenting system? Please tell me. No, Sometimes it gets filers and sometime it won't. However, keep on marking them as SPAM so that Blogger can recognize Spam comments next time someone leaves the same comment! I think my blog theme does not work. How do I reset operation 404 pages of html theme? I added Widget, however does not work. What could be the problem?